Decide whether the Gift Certificates you want to give should be for public classes, custom classes, or private lessons. If you haven't already discussed it with Dancer Guy, call him at (970) 207-9176, or send him an email, indicating what you would like to purchase, and whether the Gift Certificate is for regularly scheduled classes, custom classes, or private lessons, since their prices are different. Again, you may pick up the Gift Certificate in person or give Dave the contact information (name, address, phone, email) of the person or persons to whom the Gift Certificate should be sent, and he will mail them after your payment clears the bank. Make payment to Dancer Guy. This can be done in either of two ways: Go to the Make Payment page and pay via credit/debit card, or send a check to Dancer Guy at 813 Marshall Street, Fort Collins, CO 80525. Note that paying via credit card is faster because it clears the bank in less than a day. 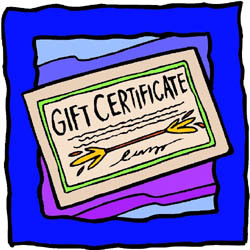 If you are paying for a Gift Certificate via the Shopping Cart, the price will vary, depending on what you are buying. Also, a Gift Certificate is not locked into a particular kind of dance stylethe gift recipient can choose later which kind of dance to learn. So, to pay for such an item with variable price and dance style, purchase the appropriate number of "Generic Dance Dollars" (at the bottom of the Shopping Cart page).